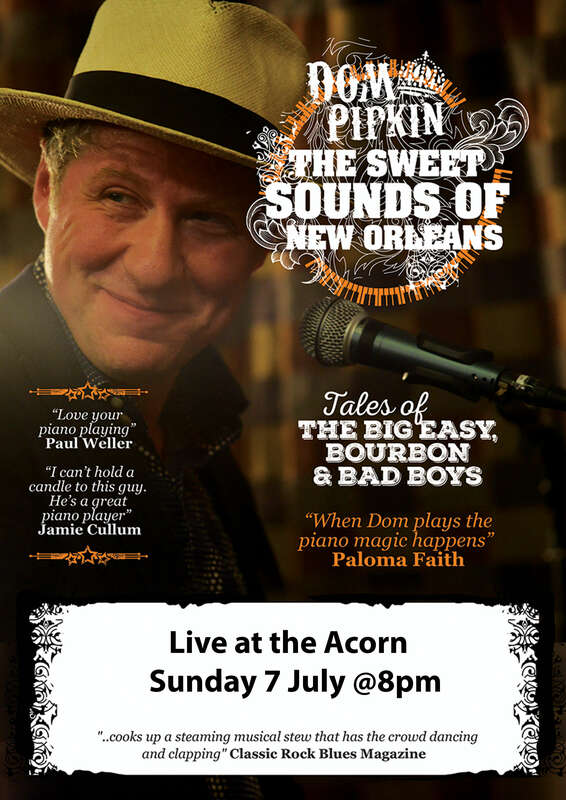 “The soul of New Orleans in the UK” Dom Pipkin is at the forefront of piano players keeping the classic New Orleans sound alive. His shows have taken him all over the world, including appearances alongside Allen Toussaint in New Orleans in 2014, as well as opening up for Dr John and Screamin’ Jay Hawkins. Pipkin has been featured on Radio 2 and Jazz FM specials about the history and influence of New Orleans piano and has recorded and toured with artists from all genres including Pee Wee Ellis, Laura Mvula, Paul Weller, Ray Davies, Paloma Faith, Eric Bibb, and David Byrne. Mostly known for his fiery interpretations of the rolling New Orleans sound, he is equally at home with hard driving boogie-woogie, down-home blues, and classic stride and jazz material, all of which featured in his acclaimed “Smokin’ Boogie” show combining breathtaking piano with great anecdotes, sadness and laughs.